"God does deliver, sometimes from difficulties, but often through difficulties," says Jenny Broughton, a pastor's wife and nationally known speaker, now living in Oklahoma City. Jenny speaks from experience. She recalls the time when, as an 11-year-old girl, she stood sobbing on the doorstep of her grungy pink house where, several hours earlier, her father had strangled her mother and then fired a 32-caliber bullet into his head. On that afternoon of April 19, 1963, she hugged her Chihuahua named Tiger as she watched the commotion in her front yard in Corpus Christi, Texas. Amid the flashing red and blue lights, a detective took notes, an officer by her side smoked a cigarette, a photographer clicked a camera, and onlookers flooded her yard. No one held her. What this little orphan could not know then was that many years after the deaths of her parents, history would repeat itself and that she would learn of still another traumatic event in the life of her family. Neither could she imagine that God would someday use her to help thousands of children and adults. Jenny's brothers were placed in foster homes. One sister was placed in a foster home and then adopted; her other sister, mentally retarded, was placed in a special school. 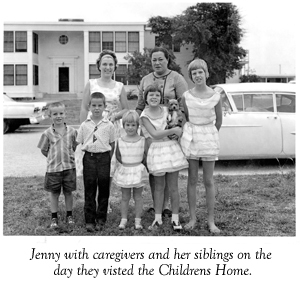 The South Texas Children's Home was Jenny's home until she graduated from high school in 1970. The Home continued to provide encouragement and help while Jenny was in college. She is a graduate of Howard Payne University. After college, Jenny taught English: Her husband, Sam Broughton, was called to the ministry and Jenny became a pastor's wife. Sam is now pastor of Ethnos Church (E-Church), Oklahoma City. Sam and Jenny have been married for 35 years and have three married daughters. Jenny is very grateful to the Children 's Home. It provided her a safe and loving environment in which to receive Jesus Christ as her Savior. Now Jenny is doing something to repay a debt she feels can never be repaid. God has given her a speaking ministry where she encourages and entertains adults and children. She shares how her relationship with Christ has provided healing in her life. She says, "God is at work all around us, in the lives of adults and children." Jenny shares a biblically-based message through humor, anecdotes, and excerpts from her pilgrimage to wholeness. One listener shared, "She had me laughing one minute and crying the next." In 1980, tragedy struck again. Jenny's brother, a security guard, mimicked his parent's murder-suicide. When his wife left town after six weeks of marriage, R. W. Lovic followed her, kidnapped her, shot her, and then shot himself. His suicide note read, "My daddy did it this way and so will I." 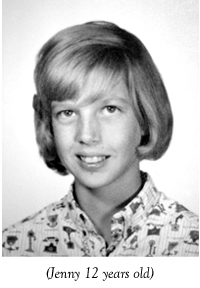 Jenny also learned that her father, Ralph Lovic, as a boy in the 1930's, had discovered the corpse of his own father in a barn. Broughton's grandfather had ended his life with a gun. Jenny later learned one more family secret. The man she knew as her father, Ralph Lovic, was not her biological father. Jenny's mother, Virginia, was already expecting a child when she married Ralph Lovic. Jenny's real father was Virginia Lovic's own adoptive father. Many would expect a child with Jenny's background to repeat the cycle of alcoholism, verbal and emotional abuse, sexual interferences, and family violence. But Christ has made a difference in Jenny's life. Jenny now speaks to groups across the nation. She has spoken at the Southern Baptist Convention, the Texas Baptist Convention, Glorieta, WMU conferences, and to many churches and civic groups. She has shared the platform with Billy Graham, Governor Jimmy Carter, Point of Grace, and Anne Graham Lotz. She is also a speaker for Stonecroft Ministries and the Christian Women's Club. She wants to bring glory to God and often speaks for Child Care Ministries.